Well, as happens every so often I'm releasing a spew of my alphabet letters. I'm excited. I'm almost done with this project. SHWA-BAM! 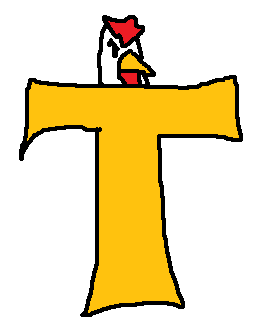 This is the letter "T" Usually it looks like a tall line with a wide line dropped on top of it. I decided to add a bit of flare on the left side so it wasn't boring. Then I went to myself, "But where does the chicken go..." Then the lower-case hit me. "t" Little thing popping off the top. And I was like, "Okay!" So that's that as far as T. goes. It looks like the chicken is wearing a yellow snuggie. I can totally see it man. Thanks for the heads up.